And while it’s been widely acknowledged that issues of altitude and space limitations will always constrain what airlines can do food-wise, there are definitely some pretty spectacular options out there. For example, there were the limited-edition specialty menus run on British Airways through the duration of the summer Olympics designed by British celebrity chef Heston Blumenthal and Michelin-starred chef Simone Hulstone, which drew inspiration from menus served at the 1948 London Olympics. Chocolate fondant with a salted caramel center topped with hazelnuts, anyone? Singapore Airlines First Class dining experience. 1. Singapore Airlines:Having been named the best in-flight meal by theTimes UKin 2009, and setting the bar high with their Givenchy tableware as well as a cookbook featuring recipes for dishes served on-board, Singapore Airlines has a reputation to maintain. Not content with getting just one celebrity chef from one locale, the airline brought together a panel of international chefs that includes Americans Alfred Portale – celebrated as a New American cuisine pioneer and the talent behind NYC’s Gotham Bar and Grill – and Suzanne Goin, the noted LA chef behind restaurants including A.O.C. and Lucques, whose meals are available on flights between Singapore and U.S. cities; Singapore’s own delegate, Sam Leong, and the UK’s Gordon Ramsay, who also advised them on their business class meals. You can evenBook the Cookand select your meal in advance, just so you can be sure that you get your first choice! Want to try some of these meals out for yourself? Put those Star Alliance miles you’ve earned on United or US Airways to use. You’ll need 60,000 United miles each way for a Saver level business class award between North America and South Asia (70,000 for first class – not Suites), or 120,000 US Airways Dividend Miles roundtrip for business (110,000 to Tokyo/Seoul) and 160,000 for first). A salad by Neil Perry on Qantas’ International Business Menu. 2. Qantas:Now celebrating the 15th anniversary of its relationship with Australian celebrity chef Neil Perry, Qantas is offering its first class passengers, who have access to 12 main course choices and an 8-course tasting menu on selected services, a special menu of favorite signature dishes from the past decade and a half, including the likes of seared grouper with tomato, chilies and caper sauce with sugar snap peas and potatoes, as well as light meals like pumpkin and gorgonzola pizzette with rocket salad. The special anniversary Neil Perry menu for their international business class includes rustically gourmet dishes like duck shepherd’s pie with sweet onion relish. Anniversary year or not, Perry always keeps it fresh on the meals served to first and business class passengers with a menu that changes quarterly to incorporate new dishes. Qantas is a member of Oneworld, and while award availability can be very limited, you can fly between North America and Australia for 75,000 American Airlines miles roundtrip in coach, 125,000 in business, or 145,000 in first. You could also use 50,000 British Airways Avios each way between LAX and Sydney in coach, 75,000 Avios in premium economy, 100,000 in business, or 150,000 in first, though obviously that’s not a great value proposition. The JAL BEDD – AUBERGE service features four star chefs. 3. Japan Airlines:Three-Michelin-star chef Seiji Yamamoto came up with the menu for first class meals on all of Japan Airlines’ international flights, with dishes that draw on traditional Japanese cooking techniques infused with an international flair. In first class on the airline’s Narita-London flight, this might mean anything from a Japanese-style hangar steak with grated radish sauce, to steamed flounder with chestnut. Meanwhile in executive (business) class on the Narita-London flight, items range from Western dishes like roasted fillet of Scottish beef with chasseur sauce to Japanese items like deep-fried flounder with mushroom sauce. Since JAL is a member of Oneworld, you can try out some of these menu items firsthand by using American Airlines miles to fly between Japan and Europe for 35,000 each way in economy, 52,500 in business or 70,000 in first. 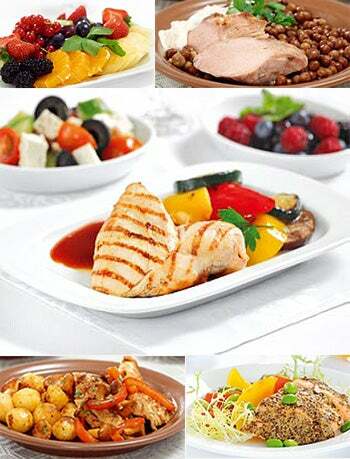 A variety of dishes served on airBaltic. 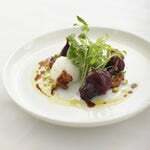 4. airBaltic:Maybe you’ve never heard of Martins Ritins, but he’s cooked for the likes of Queen Elizabeth, Prince Charles and Elton John, and he’s the executive chef at Vincents Restaurant in Riga, Latvia, whose national airline tapped him to craft menus for its business class customers in 2009. He touts his preference to choose the best organic produce available from the 60 local farmers he works with, transforming the ingredients into traditional Baltic fare, which is offered on all flights over an hour. Seasonal delicacies including rhubarb, asparagus, homemade cheese and free range chicken find their way into appetizers, hot main courses, and desserts. Serving more than 60 destinations from its home base of Riga, Latvia, airBaltic has a network that spans Europe, Scandinavia, Russia, CIS and the Middle East. Though the airline isn’t a member of any alliance, it does have codeshared flights with severalother carriersincluding Air France/KLM, Lufthansa and Air Berlin. 5. Delta Air Lines:Chefs from across the U.S. strut their stuff with a variety of menus for Delta. Those traveling in coach on a flight longer than 750 miles or 90 minutes in the contiguous U.S. can purchase a meal created by Boston-based chef Todd English, such as a chicken bistro salad with goat cheese crostini and organic spinach ($8). Food Network star and NapaStyle chef Michael Chiarello designed the BusinessElite cabin meals ondomestic transcontinentalflights between New York JFK and Los Angeles and San Francisco. For international BusinessElite class flights, Miami-based celebrity chef Michelle Bernstein creates Western-themed five-course meals that change seasonally. October’s menu includes pan-seared cod with artichoke-olive sauce and celery root puree. Award travel on Delta’s transcontinental routes start at 25,000 miles for coach for low availability and 60,000 miles for BusinessElite roundtrip. Internationally, you can find low-level award tickets on Delta between North America and Europe starting at 100,000 miles roundtrip in BusinessElite. 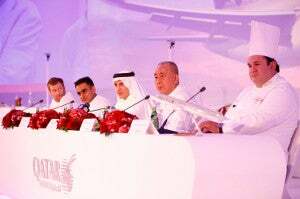 Qatar Airways Chief Executive Officer Akbar Al Baker with the airline’s new culinary team of acclaimed chefs: Tom Aikens, Vineet Bhatia, Nobu Matsuhisa and Ramzi Choueiri. Photo courtesy of Qatar Airways. 6. Qatar Airways:Just launched, the Qatar Airways Culinary World Menu features signature dishes by four chef luminaries: the UK’s Tom Aikens, the youngest British chef to be awarded two Michelin stars; Mumbai-born Vineet Bhatia, the only Indian chef to have received two Michelin stars; Lebanese chef and TV star Ramzi Choueiri,whose daily live TV cooking show attracts more than 10 million viewers; and Nobu Matsuhisa, known simply as Nobu, who has spread Japanese cuisine, melded with South American ingredients, around the world with 29 restaurants in 25 cities. Available in first and business class seats on flights to and from Doha International Airport, the menu will feature rotating items from the four chefs’ restaurants and cookbooks. Air France first class offers an exceptional menu created by Joel Robuchon, Guy Martin, and Jacques Le Divellec. 7. Air France:Food and wine are the lifeblood of France, and so of course the culinary adventure begins as soon as travelers set foot on their national airline, which employed chef Joel Robuchon (with 28 Michelin stars, the most decorated of any chef worldwide) to dream up a special menu for its La Premiere meal service, along with Guy Martin, the Michelin-starred chef from Paris’s Le Grand Vefour, and consulting chef Jacques Le Divellec. Meals include an amuse-bouche, soup, main course, cheese course and baguette, plus a dessert from French pastry dynasty Lenotre on flights leaving from Paris. Sadly, to redeem miles for a first class ticket aboard Air France, you must be a Flying Blue elite and redeem an extraordinary amount of miles. Sam Choy’s Hibachi Miso Chicken on American Airlines. 8. American Airlines:Depending on where you’re flying and which class, American Airlines offers up a varied selection of culinary choices. Chef Richard Sandoval, who owns 20 restaurants worldwide and was named “Restaurateur of the Year” byBon Appetitin 2006, does the honors in the premium class cabins on flights between the U.S. and Europe, Asia and Latin America, with a menu that rotates monthly and includes a lemongrass-marinated chicken breast with yucca puree. Meanwhile, chef Marcus Samuelsson, who owns Red Rooster Harlem in New York City and won season two of Bravo’sTop Chef Masters, offers his “New American Table” menu for purchase in the main cabin on domestic flights more than two hours in length, with items like a turkey and chutney sandwich with artisan-style bread and apple cranberry ginger chutney. Other celebrity chefs who have consulted for the airline include Sam Choy, Maneet Chauhan and Cindy Huston. To try out Sandoval’s menus between the US and Latin America, you’ll need 50,000 miles each way in business class or 62,500 miles for first class for a flight between Miami or New York and Buenos Aires. A dish from the five-course United Business First International premium cabin dining menu. 9. United Airlines:Beginning in 2007, those passengers jetting away on eastbound flights from North America to Europe, or on the airline’s premiumtranscontinental service, could enjoy meals envisioned by celebrity Chicago restaurant owner and chef Charlie Trotter. On international flights, those in United Global First seats are treated to six-course meals from menus crafted by the airline’s “Congress of Chefs,” with highlights including a hot appetizer and soup course. And those in United Business First seats will receive a five-course meal including a cold appetizer and salad. Perhaps most distinctive of all, both classes of passengers can enjoy what the airline’s website refers to as their “signature ice cream sundae service.” For those with a sweet tooth, sundaes are also available on select long-haul lunch and dinner services on domestic flights. 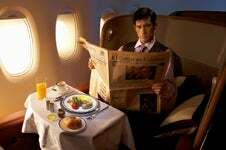 Etihad won “best dining award” at the 2012 Skytrax World Airline Awards. 10. Asiana Airlines, Austrian Airlines, Etihad Airways, Gulf Air, and Turkish Airlines:While none of these airlines has enlisted any celebrity chefs to speak of, they get extra points for having hired real, live chefs to come onboard and prepare meals en route during their flights, or at least for having trained many of their flight attendants with sommelier and chef skills. Austrian Airlines was the first to offer this service. Abu Dhabi-based Etihad Airways unveiled its live-chef service in their first class cabins on long haul flights in 2011 and earned a nod for “best first-class catering” at the 2012 Skytrax World Airline Awards. Asiana has brought along a sushi chef on its first class flight between Incheon and Los Angeles since 2006, and since it’s a member of Star Alliance, you can use your United or US Airways miles to enjoy sashimi over the Pacific.